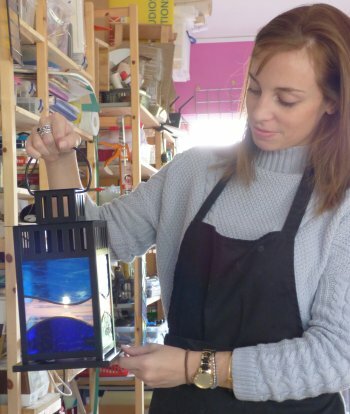 Make your own foiled stained glass lantern in just one day! This one-day class will introduce you to the basics of the foiling method of stained glass (sometimes called the Tiffany method) and you'll make your own coloured 28cm high lantern to take home! 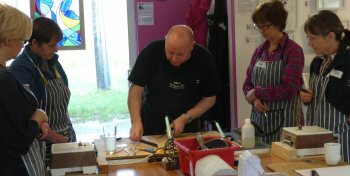 With a maximum of 5 students and two tutors you can be sure of plenty of attention and guidance throughout the class, and a fun experience you'll remember for a long time. The class begins with a demonstration of how we score and break glass, discussing common issues and a review of the tools you'll use. You'll then practise cutting and breaking glass, following the pattern for your chosen lantern design. Once comfortable with scoring and breaking the glass, we'll ask you to choose your project design and the coloured glass you'll use; you'll then cut the coloured glass for 3 panels for the lantern. Lunch is taken at the nearby ARTea Rooms at 12-30. In the afternoon you'll finish cutting the coloured glass and then use the grinder to ensure the pieces fit. Then it's time to foil and solder your three lantern panels , ready for fitting in the lantern itself. If time allows, you may opt to darken the solder using patina for a more traditional appearance. 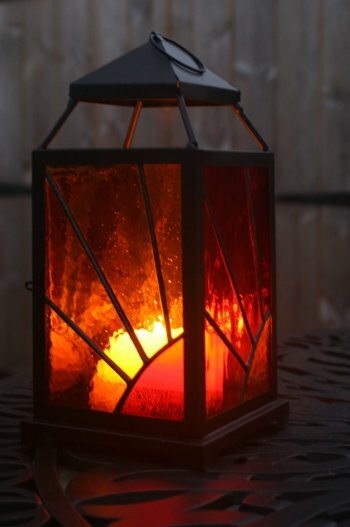 Your lantern is suitable for use with a block candle, a tealight or battery-operated nightlight. "Thank-you for a wonderfully creative day. Everything in the class description was covered AND MORE!" "A fantastic day. Mike & Jenny are great at building confidence." "Very good course. Would highly recommend. Thank you.."
"Great day….extremely satisfied with terrific teachers who were tremendous. Thanks Guys!" 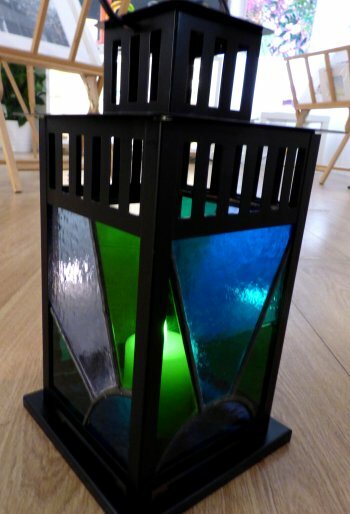 Make your own beautiful coloured glass lantern in one day!